custom printed with a logo for healthcare, pharmaceutical promotions. 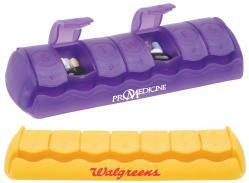 Pill boxes and pill organizers with logo imprinted for an ever growing healthcare related market. 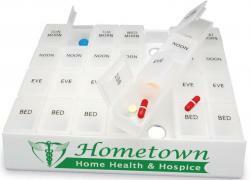 your advertising dollar for home health, retail medical, hospital, pharmaceutical promotion. In addition most travel related businesses and vitamin retailers benefit using these items. 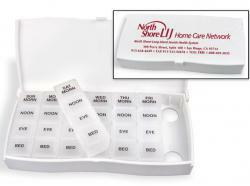 Browse this page to buy Pill Boxes, Pill Cutters and Pill Organizers printed with a logo. For related healthcare items imprinted visit our Lip Balm and Hand Sanitizers pages. 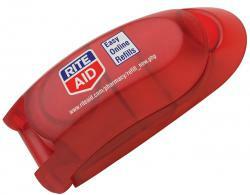 pharmaceutical, medical and travel related promotional items.